Gonzaga students paint a mural on a new nonprofit restaurant called Fresh Soul in the East Central neighborhood. The mural was designed by Spokane Arts Fund program manager Ellen Picken in collaboration with Spokane Arts, Fresh Soul and Gonzaga University. During his first campaign for city council president, way back in 2011, Ben Stuckart called the plan to eliminate the city's arts department a mistake. He campaigned against it. "At a time when we want to maintain the things that make our city a special place, cutting the arts, the parks, and the youth department is not the right answer!" he wrote in a 2011 campaign message. After his election, the arts department was cut anyway. Since then, the economy has improved. The city budget has stabilized. As he fought for re-election last year, one fundraiser announcement called Stuckart the "councilperson who has done more for the arts in recent memory than any other." The city's direct investment to the arts, however, has remained a piddling $80,000 a year. Now, after an overwhelming electoral victory, Stuckart is pushing a proposal that would more than triple the amount of arts funding. His plan wouldn't raise a dime of taxes; what it would do is take away a chunk of budgetary flexibility. Right now, all the money raked in from the city's admission tax — levied on movie, concert and art show tickets — is dumped into the general fund. Stuckart's ordinance would mandate that a third of that revenue be diverted into a fund only usable for the arts. About half that would go to operations and programs for the Spokane Arts Fund, while the rest would be available for grants to local artists and arts organizations. In the long term, Stuckart says, the benefit to a thriving arts and culture scene is clear. "That's what young people want," Stuckart says. "That's what they're attracted to. And that's what's going to keep them here." Even before the recession, when the national economy was thriving, Spokane mayors like Jim West and Mary Verner faced brutal budget deficits. The problem was baked into Spokane's financial policies: Every year, costs increased faster than revenue. And the arts paid the price. Year after year, the arts budget was whittled down, and the arts department grew smaller. When the state assessed Spokane County's "creative vitality index" from 2010 to 2012, it found a region where creative jobs were growing at a rate far faster than Washington state or the nation. But when the study measured Spokane's level of arts funding and audience participation, the results were dismal. Compared with national rates, Spokane in 2012 had about half the participation in the performing arts, 43 percent of the revenue for arts organizations, and little over a third of the sales from art galleries and individual artists. In December 2012, the arts department suffered the final blow: A split city council narrowly passed Mayor David Condon's budget, eliminating the arts department entirely. Instead, the city planned to funnel funding to the Spokane Arts Fund, a local nonprofit, to take over the mission of the arts department. Each year, that funding was scheduled to decrease. Spokane Arts Director Karen Mobley, who'd worked for the city since 1997, found herself without a city job. "There was a lot of feeling amongst people who volunteered and helped us that there was a loss," Mobley says. "We lost a lot of our key volunteers in that transition." When the arts department was with the city, it had access to city accountants, tech support, website designers and legal aid. When it split from the city, that entire support structure was lost. The Arts Fund still has to spend time lobbying every year for city funding. For the artistic community's morale, the entire situation was a gut punch. "There was a feeling with some of the people ... that they'd been betrayed by the city," Mobley says. "Their belief system about what a community should do and be involved in was not being respected." Laura Becker, the executive director of the Spokane Arts Fund, has been calling other cities, talking to Spokane's rivals to see what they did differently: The city of Tacoma spends 11.5 times more on city arts programming than Spokane, she learned. Boise? Over 20 times more. While the variation in arts budget structures make cross-city comparisons difficult, to Becker the conclusion is clear. "We're embarrassingly low," she says. "I've seen the impact and the value, and arts in other cities." She wants to remain optimistic. 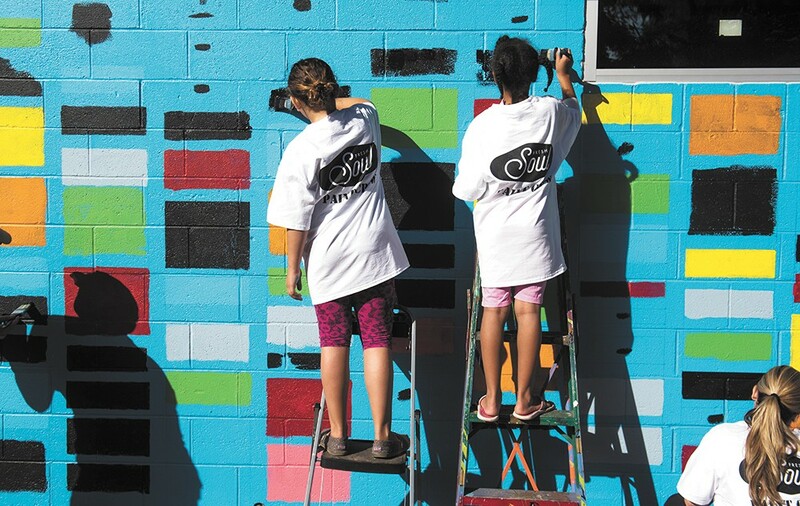 Despite little city support, the local arts scene has built itself back up, partnering up to launch art shows and paint murals like the one on the Fresh Soul restaurant in East Central. "People here are survivalists. They're scrappy," Becker says. "They figure out ways to work around barriers." "We are very much an organization that is struggling to keep its doors open, for lack of a better term," Ewing says. "We're really struggling in order to keep afloat." Organizers can only spend so many years donating thousands of volunteer hours before they burn out, she says. Lately, Becker says, she gets daily calls from members of the arts community, asking for funding. But the Spokane Arts Fund isn't a grant-giving organization. Instead, artists have to rely on support from businesses, a process she calls "exhausting, precarious and troubling." When she looks at Stuckart's proposal, she sees relief. "I think that stability will ease the rocking boat, and the perception that the arts are always marginalized and frivolous," Becker says. In particular, she says, the extra funding for grants would revitalize the scene. There's a cruel irony in grant funding: It takes grant money to make grant money. Large grantors like the National Endowment for the Arts often give preference to larger, more robust organizations. They often give out matching funds, requiring organizations to secure other funding before accessing a grant. Becker says that Stuckart's plan would help solve that problem, directing the city's spotlight on the artistic talent toiling in the shadows. "There are amazing artists, " she says. "They don't get the visibility they deserve. This would help alleviate that." Officially, the city administration voices support for the arts. "Today more than ever, the arts are critically important and the administration recognized that," Chief Financial Officer Gavin Cooley says. On the other hand, it took years for the city to fix its budget gap. So Cooley is cautious when it comes to Stuckart's proposal. "I never want to see another mayor put in that position, of thinking they have no choice but to eliminate a very important program in the city government," Cooley asserts. There's no free lunch, he says. Spending more on art means spending less someplace else. Stuckart remains optimistic, suggesting the extra spending could be easily included in the growing budget. "We're not going to cut anything," he says. "There might be other priorities that we could say, well, that's a bigger priority that we should fund more. But we're not going to actually have to take police off the streets to do this." In a city plagued by property crime and potholes, art spending can be a tough sell. Comments on the conservative "8th Man" Facebook page mock Stuckart's proposal, suggesting the best public art project would be to "paint" the "canvas" of city streets with asphalt. "My ideology would have a vital city that supports the arts," says Mike Fagan, the sole conservative on the council. Fagan says the city hasn't yet reached that sort of prosperity, and suggests $170,000 in new spending might be better spent elsewhere. Still, he appreciates Stuckart's willingness to track the effectiveness of an increased arts budget. "I'm going to stay open-minded," Fagan says. The case for art spending is difficult to measure, but plenty of studies promise explosive results. One 2012 study predicted that for every $1 spent on arts and culture in Michigan, $51 would return to the state's economy. "It is an economic driver," Ewing says of art. "It can be a crime deterrent. It revitalizes neighborhoods." With the Window Dressing project, Ewing uses public art as a weapon against an outbreak of urban blight, turning vacant storefronts into art installations. Businesses are far more likely to want to move next to a colorful mural than boarded-up windows. Then there's the recruitment angle: Stuckart argues that a thriving arts scene in Spokane wouldn't just draw talent. It would stop it from leaving.